The Village of Oak Park has been home to some of the most notable people in American culture. The influence of Frank Lloyd Wright and Ernest Hemingway, among others, is celebrated in the architecture and culture of the community. Unlike other suburban destinations in Illinois, Oak Park has a unique sense of place, known for entertainment, arts and connectivity. This micro-urban destination is the perfect place for those who enjoy the buzz of a city, yet prefer to be surrounded by beautiful tree lined streets and world class design. See all the Frank Lloyd Wright homes in Oak Park here. 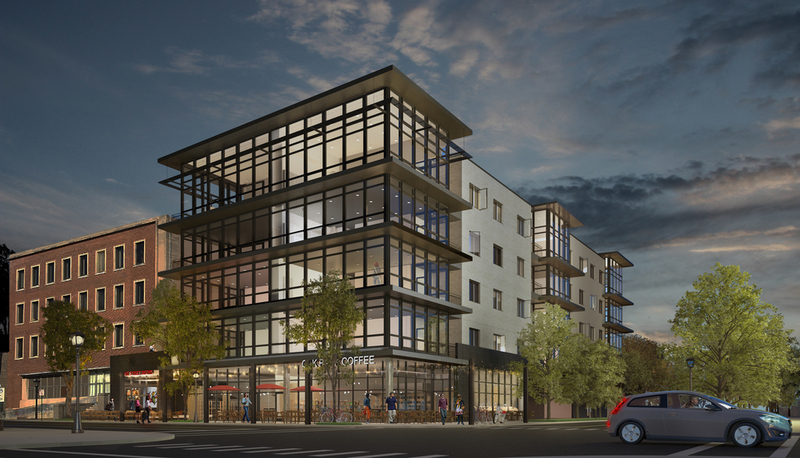 Ranquist Development Group, which has over 20 years of experience building in Chicago, and Campbell Coyle, a Chicago-based developer focused on catalytic projects, aim to bring a new type of living to Oak Park’s design legacy. District House provides artful urban residences in the heart of Oak Park. The project, located in the Village’s Hemingway District just east of downtown, is comprised of 28 luxury condominiums. The residences offer a new standard for urban living in Oak Park without sacrificing the high end lifestyle and amenities that residents are accustomed to in the area. The building also provides 4,500 square feet of retail on the ground level, emphasizing the project’s connection to the broader neighborhood and downtown Oak Park. Designed by Seattle-based Miller Hull and Chicago-based Northworks, the project masters the use of contemporary materials and clean lines to provide residents with an unprecedented living experience in Oak Park. The floor to ceiling glass walls in the living spaces draw a direct connection to light and air, linking the resident to its environs. The retail level, which enjoys the same amount of thoughtfulness in design, invites people from the area to be a part of this contemporary compliment to Oak Park’s dynamic retail districts. The interiors of the homes feature a contemporary open concept design aesthetic. The units are a combination of 3 bedrooms, a den and 2 or 2.5 bathrooms. The contemporary, flat panel kitchens are designed by Italian cabinet designer Archisesto. Oak hardwood floors, Bosch appliances, intelligent thermostat systems and high end bathroom fixtures are among the many high quality finishes offered by Ranquist Development Group and Campbell Coyle.